Sunday just past, I had the pleasure of being invited to an under-the-radar shindig hosted by the Climate Reality Project. It was an amazing opportunity to be present. 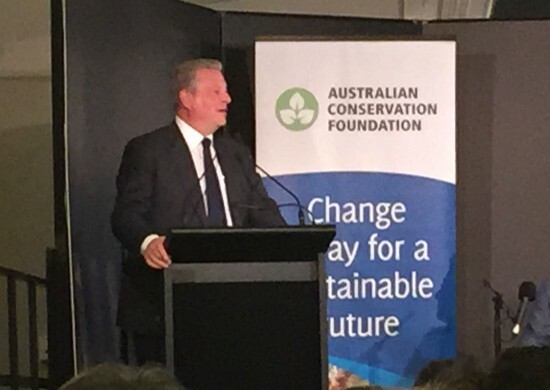 The highlight, besides catching up with other Climate Reality Leaders, was that Al Gore presented for just over an hour to the 150 gathered invitees. Now besides being the inspiration for my green epiphany via his documentary An Inconvenient Truth, the man is a fantastic orator and motivator. He gave us a message of hope regarding action on climate change. The last time I had the opportunity to see him was at the Climate Reality Leadership training that I attended in June 2014. His message has changed little since then. It is one of hope and action against climate change of a global nature that will help us overcome this time of climate crisis. The climate science only gets stronger year after year. Anyway, he spent the hour telling us that change is happening for the better as individuals, businesses, and governments begin to kick lowering their greenhouse gas emissions into high gear. Lets just say that the Afternoon with Al Gore relit the fire in my belly and gave me renewed hope that we will solve this crisis before it becomes too late. I did manage to record the audio of the session so that I could bring you a special podcast episode, however I am still waiting permission to release it. Things take longer to happen than you think they will, and then they happen faster than you thought they could. Mr Gore continued to say that he believes we are now in the momentum phase of action on climate change the began with the historic agreement between China and the United States which will lead to an agreement at Paris and subsequent continued actions afterwards. Time will tell, but I do believe he is right. Examples he gave that momentum is building is with the use of solar, wind, and battery storage, energy efficiency, sustainability, agriculture, in every part of our lives. It is going to happen. We can see it happening. Just think of this. 1 in 7 Australian homes now have rooftop solar, and in some suburbs 1 in 2 have it installed. Thinking back to when I first got my PV system installed in September 2007, I never thought I would see the day that it was so prevalent in our town. But as history shows, it is now the homes that don’t have solar PV that now stick out and are becoming the minority. It is people like you and me that are moving the needle with our daily actions by demanding that products we purchase are green, and the energy we consume is renewable, and the food we eat is organically grown or grown in our very own backyards. People like you and me are making a big difference. Lets keep the momentum going, each and every day by living a little more sustainably and taking action with every dollar we spend on the good, and avoid spending it on the bad like our planet depended on it. In fact our global civilisation does depend upon it! Keep going. Don’t stop now, as the momentum of change is happening. Growing food in a small space is often challenging, but Sue St. Jean has taken on that challenge head on. She ripped up her lawn in back and front of her 5000 ft² (464 m²) Rhode Island home, and began planting edibles to feed her family. She then became a URI Master Gardener and began to teach others and spreads the word via her local AM radio station WADK. 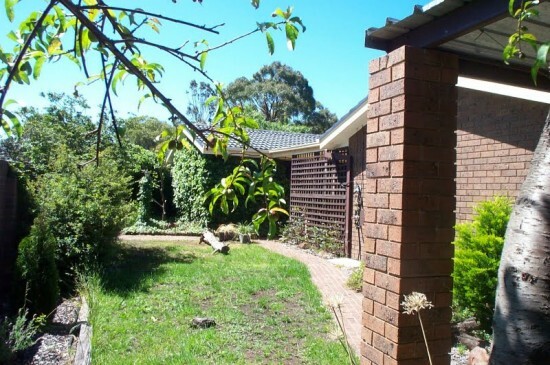 Sue writes an amazing blog at Less Noise, More Green that documents her journey about her transition from lawn to food and provides lots of tips and tricks for cooler climate gardeners in her region. Don’t forget that this podcast is supported financially by you, the listener. This not only keeps the show (and blog) advertisement free, but keeps us on the air each week. If you would like to support the show and pledge as little as US$1 to keep us up and running, please pop over to www.patreon.com/greeningofgavin/ and pledge away! Also if you like the show, use the iTunes button and leave a rating and a review. We love to hear what our listeners think about our show. Until next episode, keep it green! If so, please join thousands of others who receive exclusive weekly online recaps & tips, and get a FREE COPY of my eBook, The Greening of Gavin - My First Year of Living Sustainably. For those who don’t know, I have a passion for growing my own food here. In fact I am so in to growing our own food that I ripped up all our lawns and replaced them with garden beds and fruit trees. The vast majority of our plants are edible which is by design. I’m a big advocate for Food not Lawn! Now, I had often wondered if this trend was catching on. It didn’t seem to matter how far I walked around my neighbourhood, I couldn’t find anyone else with food growing in their front yard. Maybe I’m not as trendsetting as I think I am. Anyway, I was pleasantly delighted when I was contacted by Sue St Jean who lives in Rhode Island, USA, who also grows food in her 464 sq metre yard. 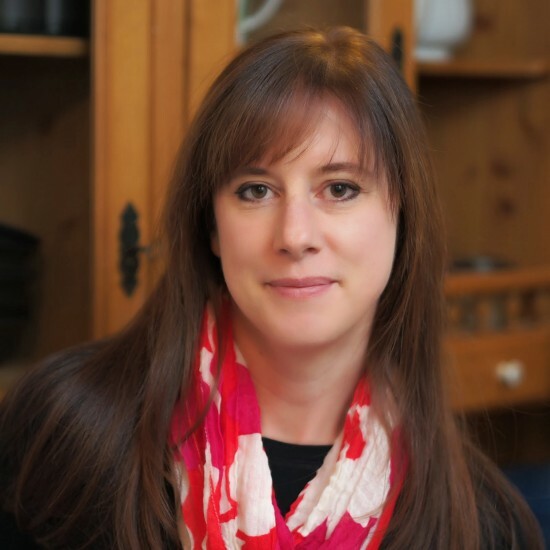 I caught up with her over the weekend and recorded a chat which will be published via tomorrow nights podcast episode. 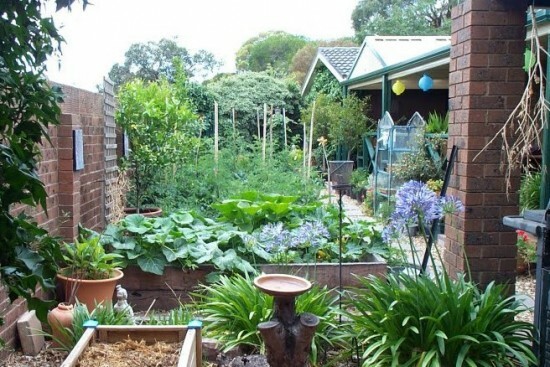 It was really interesting to learn how she grows so much food in her small urban block and her front yard, and still manages to make it look really nice which gets the neighbours onboard and manages a big crop. Then as luck (or fate) would have it, Christie, one of my Facebook followers and podcast listeners brought this story to my attention. It was regarding food not lawn! It’s about Tim Rinne who lives in Lincoln, Nebraska, USA, who was very worried about climate change and food scarcity, so he decided to take action. He ripped up his own lawn and started to grow food. This had a massive ripple effect throughout the neighbourhood and many other families now grow their own food in their yards. His story was so inspiring that I had to embed the TED talk into this post. So here’s to growing food not lawns and all the trailblazers throughout the suburbs who are trying to make a difference and set an example to show that it is easy growing food with a bit of practice. Don’t forget to tune in tomorrow for my chat with Sue St Jean!